It's Monday, which means it's time for a new challenge at Eureka Stamps. Our theme this week? "Farm Animals". Living in America's Dairyland, I probably should have done something with a cow, but I have a co-worker who raises sheep and her birthday is right around the corner. I decided to make her a card instead. I used Eureka Stamps digi2209(35) Standing Sheep and QKR Stampede (our Sister Company) digi 15621 "Another Ewe". The base of this card is a Strathmore watercolor paper 5x7 card. I used some very inexpensive watercolor paints randomly on the front, & let them dry. While they were drying, I colored my sheep with Copic markers and fussy cut her out, mounting her with foam tape to the front of the card. 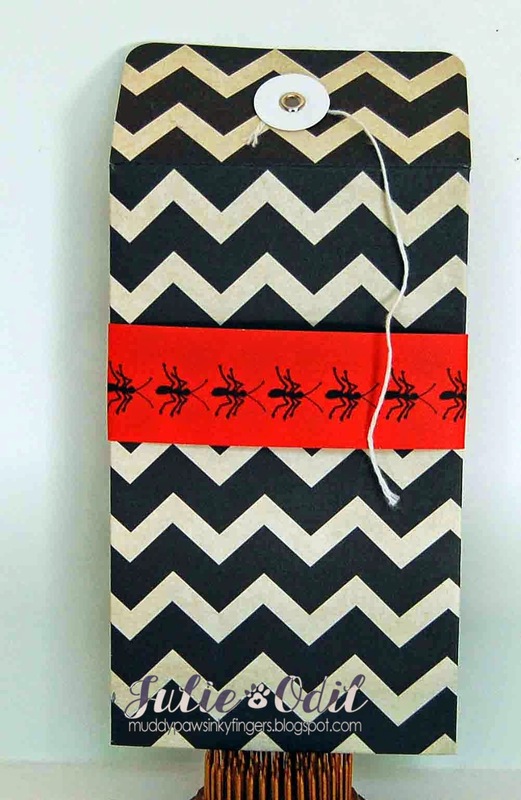 The sentiment is also foam taped, and wrapped with Cherry Red Timeless Twine. I used 3 colors of Stickles on UmWow Studio's chipboard stars. Once they dried thoroughly, I adhered them with glue dots. I have a giveaway going on, celebrating several events: I wrote my 500th blog post last week, I just reached 400 followers on my blog, and I have over 100 "likes" on my Facebook page, Muddy Paws & Inky Fingers. To celebrate all those things, I'm having a giveaway: I have some Timeless Twine, some 3 Girl JAM ribbon, a Unity stamp set, a Close To My Heart stamp set, some Pinque Peacock embellishments, a 6x6 paper pad, and various embellishments that I need a home for. I also have two generous sponsors: DigiStamps4Joy is giving a $10 gift certificate to the store, and The Cutting Cafe is offering any 3 sets. WOW! 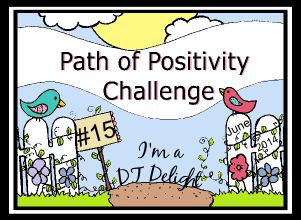 If you'd like to be eligible to win, please leave a comment on any of my blog posts between now and July 6. I'll draw a winner on my birthday. It's my day, and you get the present! I'd also love it if you "like" my Facebook page and follow my blog, if you don't already. And that's that! 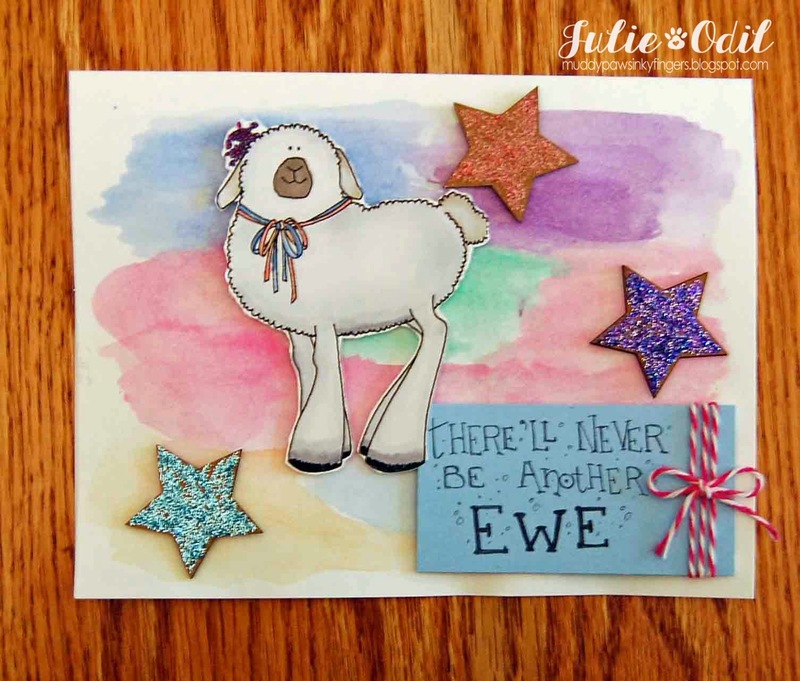 Check out the awesome designs from the rest of the DT at the Eureka Stamps Challenge blog, and join our farm animals challenge this week. Ewe'll be glad ewe did! It's Anything Goes at Fitztown! I'm still guest designing at Fitztown, and yesterday I had a chance to work with a brand new release! It was so much fun!! I worked on some coloring skills, challenging myself in ways I haven't tried before! 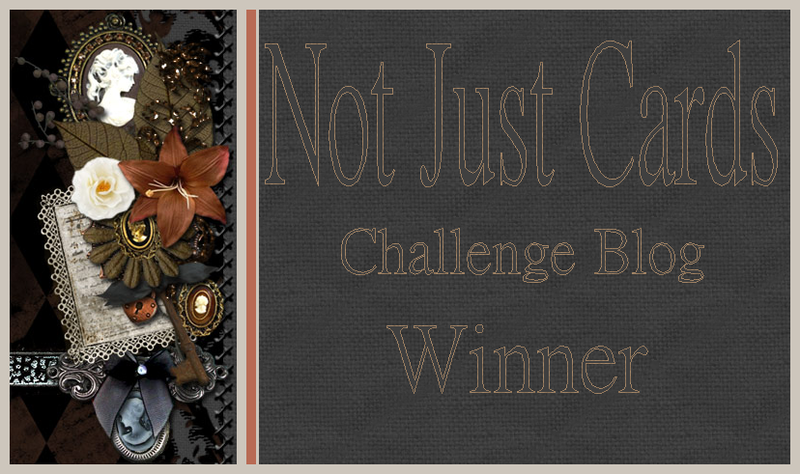 Today, there's an Anything Goes Challenge, and my card is a part of the inspiration on the Fitztown Challenge Blog. I'm excited and honored it's being showcased! 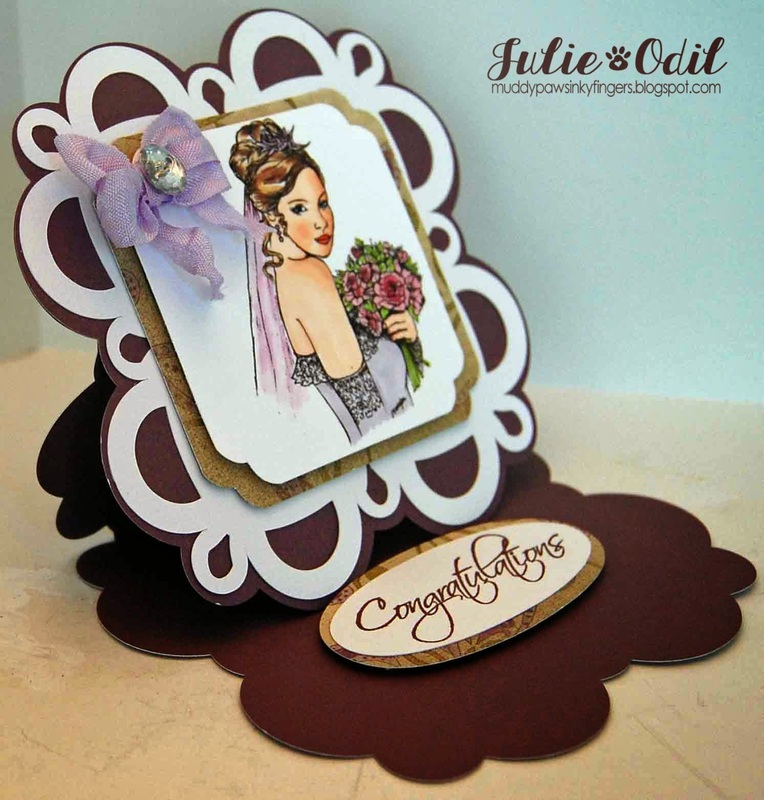 The newly released stamp is called "Bridal Wedding Day 1" and can be found in the Fitztown Etsy Store. 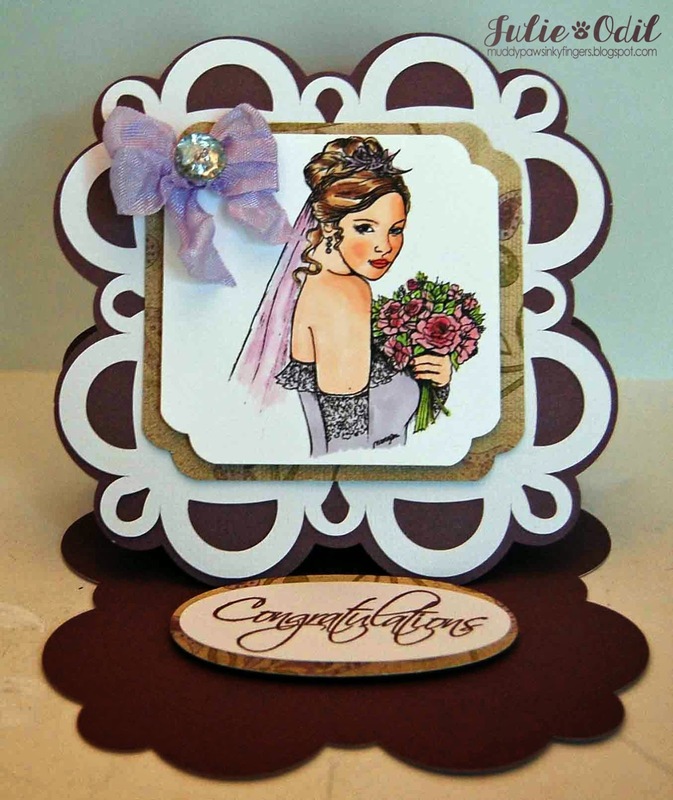 I colored the bride with Copic markers, then created an easel card to showcase her. 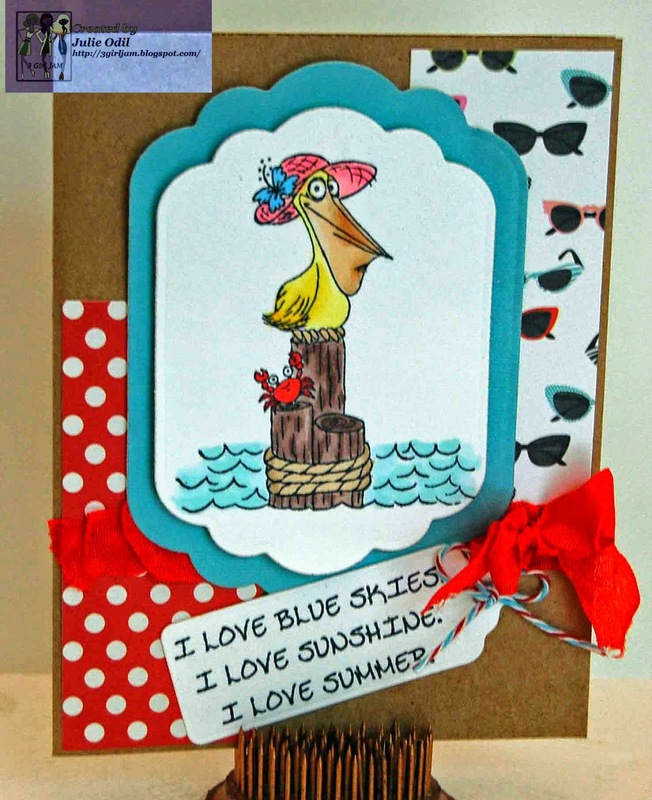 The Square Frills Easel Card is from My Scrap Chick. I cut it out using my Silhouette Cameo. The papers are from Close To My Heart, as is the rhinestone button and the sentiment stamp. The crinkle ribbon is 3 Girl JAM. 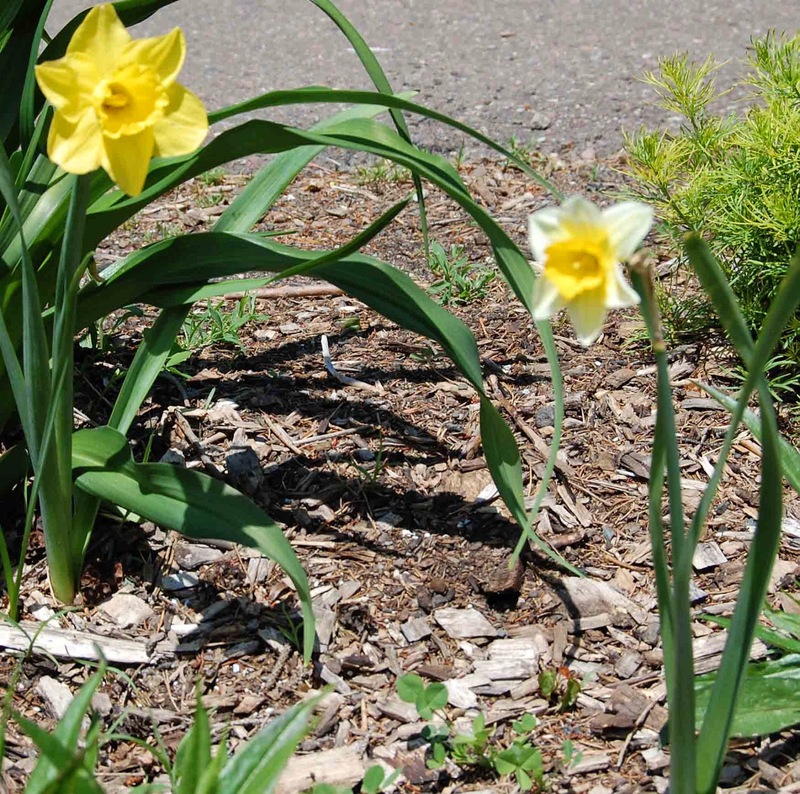 It is the Iris ribbon from the Spring Flowers Bundle. 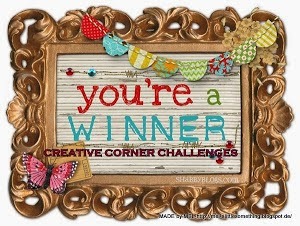 I hope you enter the Anything Goes Challenge at Fitztown! You have 2 weeks to link up! And again, I want to thank Fitztown for this opportunity as a guest designer. They have the most gorgeous images! 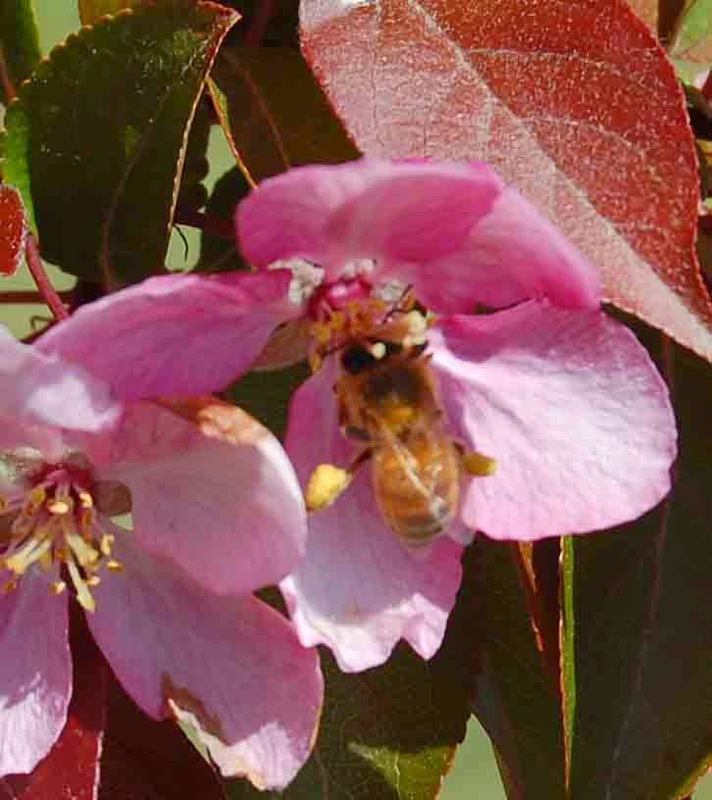 June is winding down, but we're still using Firecracker Twine on the Timeless Twine blog and the June Color Challenge is still going on for another day. 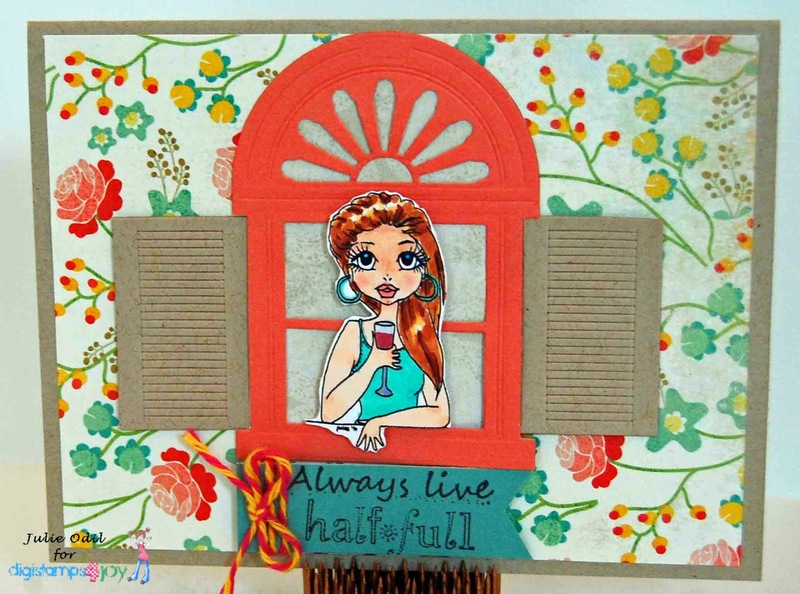 I love the new Bella Creationz June embellishment kit Stacy has made, and hope she has plans for many more! 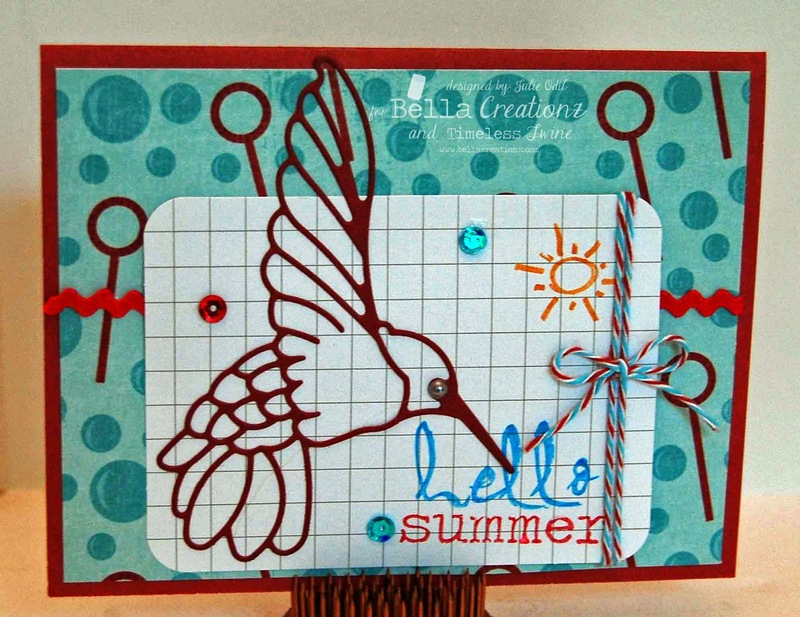 Almost everything I used on this card is part of the embellishment kit -- designer paper, stamped images from the Hello Summer stamp set, journaling card, sequins, twine (of course! ), & ric rac. The only things NOT part of the kit were the card base, a flat back pearl for the hummingbird's eye and the hummingbird die. The paper I used to cut out the hummingbird was part of the kit. The die is a Cheery Lynn die. 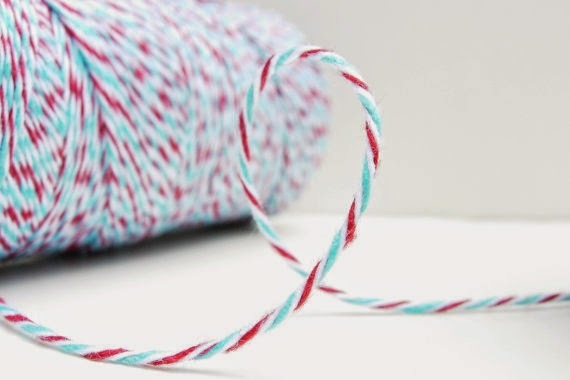 The twine I used on this card is Red, White, and Aqua Twine. I have a giveaway going on, celebrating several events: I wrote my 500th blog post this week, I just reached 400 followers on my blog, and I have over 100 "likes" on my Facebook page, Muddy Paws & Inky Fingers. To celebrate all those things, I'm having a giveaway: I have some Timeless Twine, some 3 Girl JAM ribbon, a Unity stamp set, a Close To My Heart stamp set, some Pinque Peacock embellishments, a 6x6 paper pad, and various embellishments that I need a home for. I also have two generous sponsors: DigiStamps4Joy is giving a $10 gift certificate to the store, and The Cutting Cafe is offering any 3 sets. WOW! If you'd like to be eligible to win, please leave a comment on any of my blog posts between now and July 6. I'll draw a winner on my birthday. It's my day, and you get the present! I'd also love it if you "like" my Facebook page and follow my blog, if you don't already. 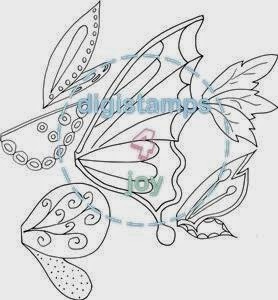 Butterflies -- I absolutely love them, and can never have too many images in my collection, so when Margy, the owner and one of the artists of DigiStamps4Joy released "Angel Wings" as one of the new releases today, I was VERY excited to work with it. These wings can be many things, and I have other ideas bouncing around my head, but first and foremost, I saw butterfly wings. I had a more elaborate card planned, but life got in the way. I made the card by using the largest wing, copying it, then flipping the image. I angled it a bit on one copy, then made a copy again. I colored one of the images with Copic markers and fussy cut that one. I layered it over the top of the first image, angled it on my card, wrapped some Aqua Timeless Twine around it and placed it over the blue 4 1/4 by 5 /12 card base. I stamped a sentiment from Close To My Heart, added some rhinestones, and my simple card was complete. Now it's your turn. 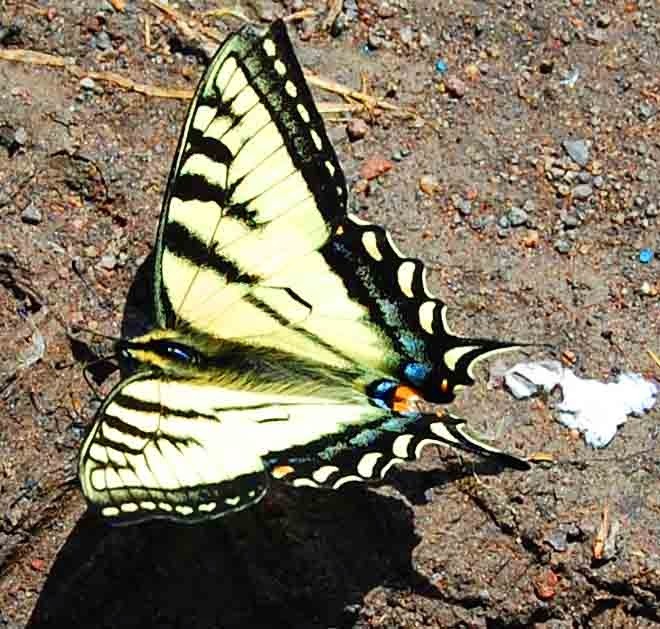 What do you see in those wings? Fairies? Angels? Dragonflies? I'd love to see your creations! And don't forget to visit the DigiStamps4Joy blog today to see all the new releases and what else the uber talented design team created. 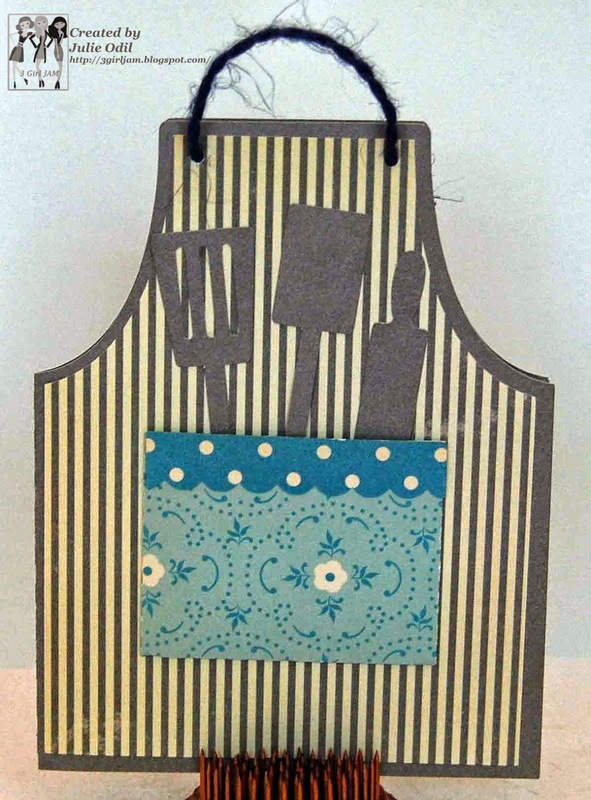 I found this cook's apron card cutting file in the Silhouette Online Store and thought it would work perfectly for the challenge. I used October Afternoon papers on the card to give it a retro feel. The tie around the neck? 3 Girl JAM jute string, of course! 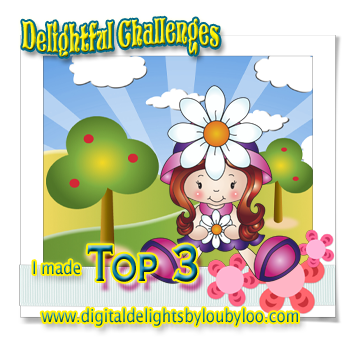 Please join the food related challenge at 3 Girl JAM -- it goes all month! Today was supposed to be my last guest designing post for Fitztown, but I'm staying on for another month (yea! ), so I'll have 2 more posts with them in July. Today, I made a shaped card to fit this week's challenge theme. I LOVE shaped cards, and I LOVE coloring flowers, so this was a particularly fun one for me! 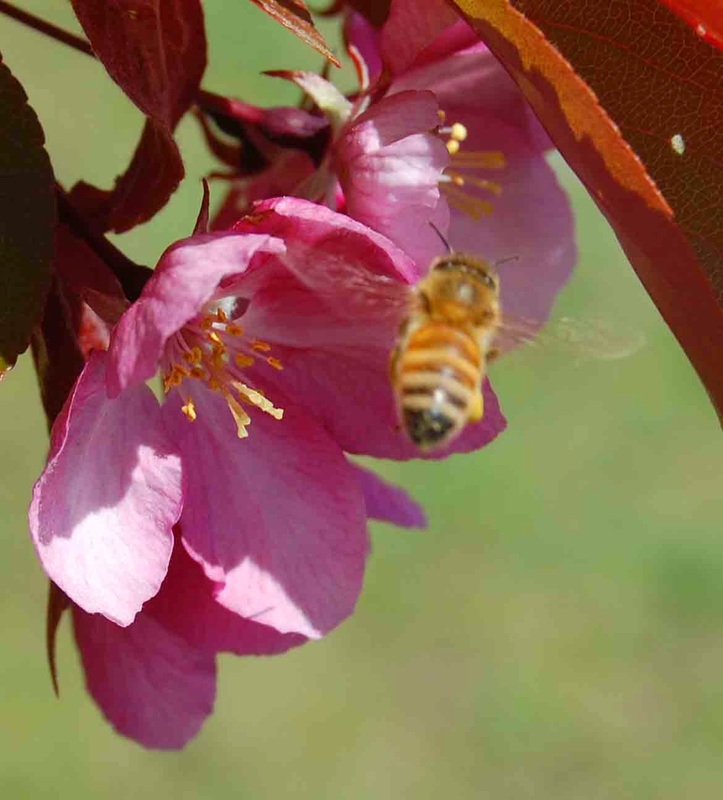 The flower is Fitztown FL1. I just love all the beautiful floral images in the Fitztown store, and this one is sooooo fun to color with Copic markers! Come join in the shaped card challenge at Fitztown! It's Friday, and today I'm posting for Pinque Peacock. I'm also combining it with Unity Friends With Flair. I love using Pinque Peacock products on my projects. They finish them off "oh-so-pretty" -- as you will see! I made a card with happy colors and a happy theme today. After all, it's FRIDAY! I stamped this happy image, then colored it with some bright colored Copic markers. I mounted it on bright papers, and found a great Large Layered Garden Beauty from Pinque Peacock to pull the card all together. 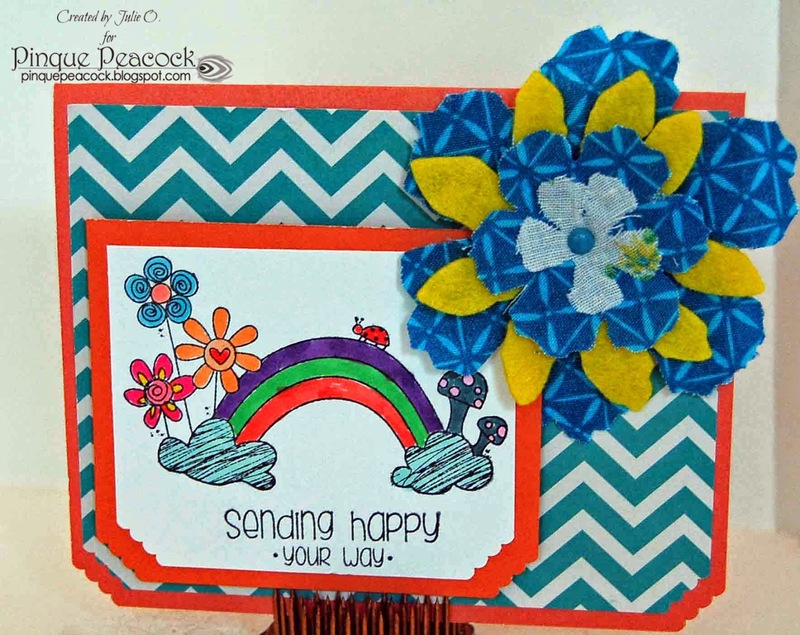 The stamp is from Unity's Stamp of the Week collection, and is called, ironically, "Sending Happy Your Way." I hope you have great plans for the weekend! It's Thursday! And I love Thursdays, because it means I get to post for 3 Girl JAM. Many things in life make me happy, but 3 Girl JAM ribbon, lace, and jute rate right up there at the top of my list! Our Summertime challenge is winding down, but summer is just getting started, so I made a summer themed card for today. 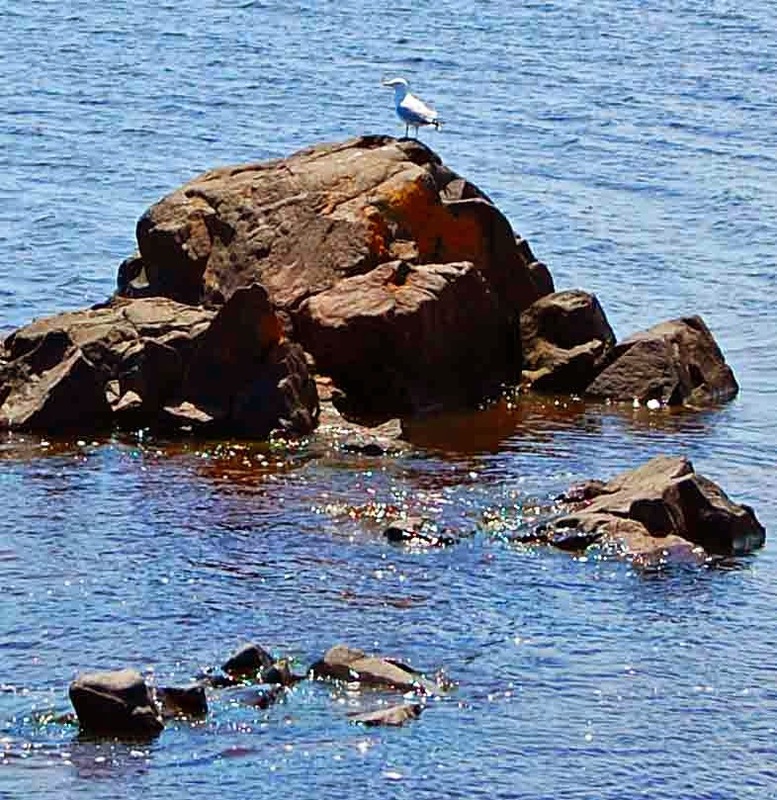 A pelican in a straw hat -- definitely summer, right? 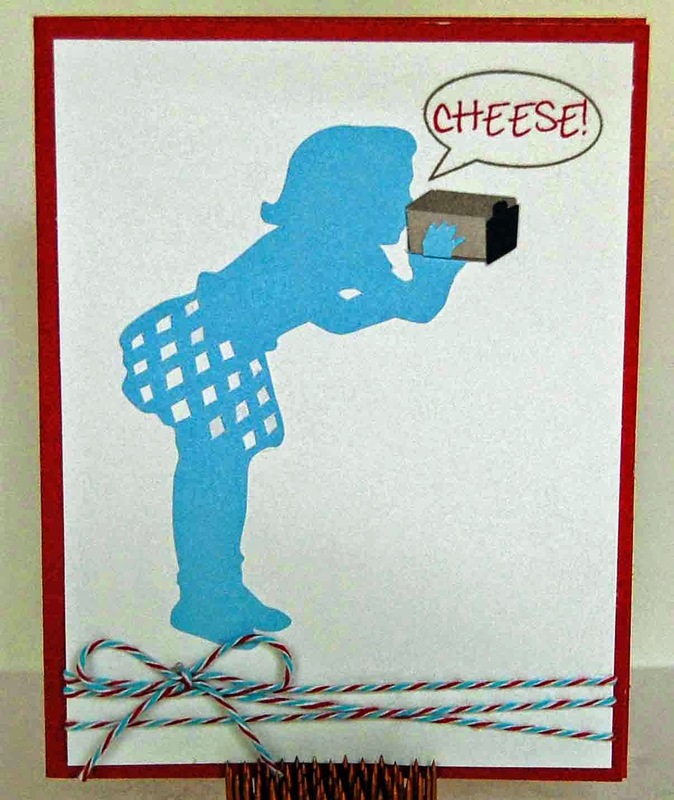 I used 3 Girl JAM crinkle ribbon from the Red, White, and Blue Bundle for this card. I LOVE the red in this bundle. It's such a true, vibrant red. 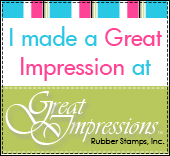 The image and sentiment are both from Great Impressions Stamps, and colored with Copic markers. There's a teeny bit of Timeless Twine there in Firecracker, and designer papers are from Carta Bella -- Summer Lovin' 6x6 pad. 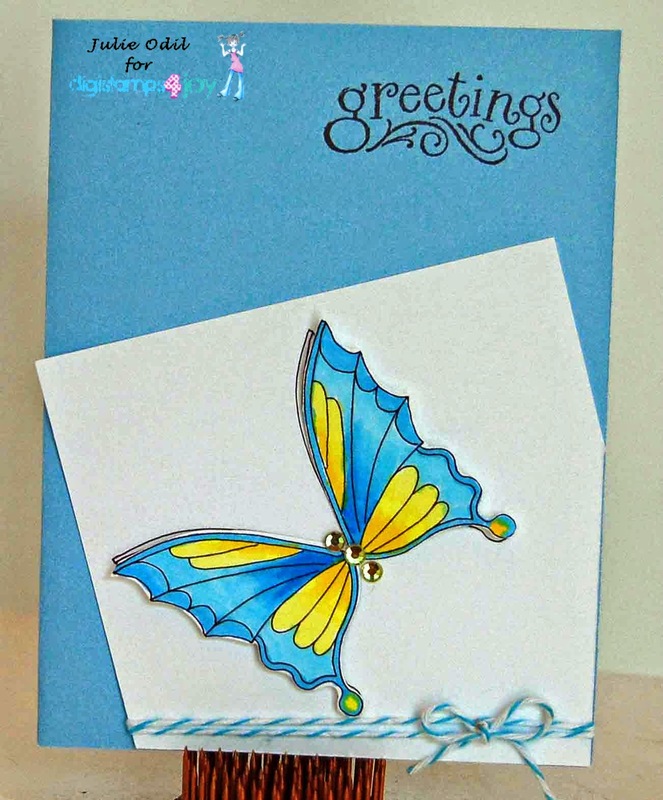 I used 2 Spellbinder label dies, and a tag die, and Close To My Heart Kraft cardstock. Need some of the gorgeous red ribbon for yourself? Use discount code JO10 for 10% off anything in the 3 Girl JAM store! Christmas in June -- really! 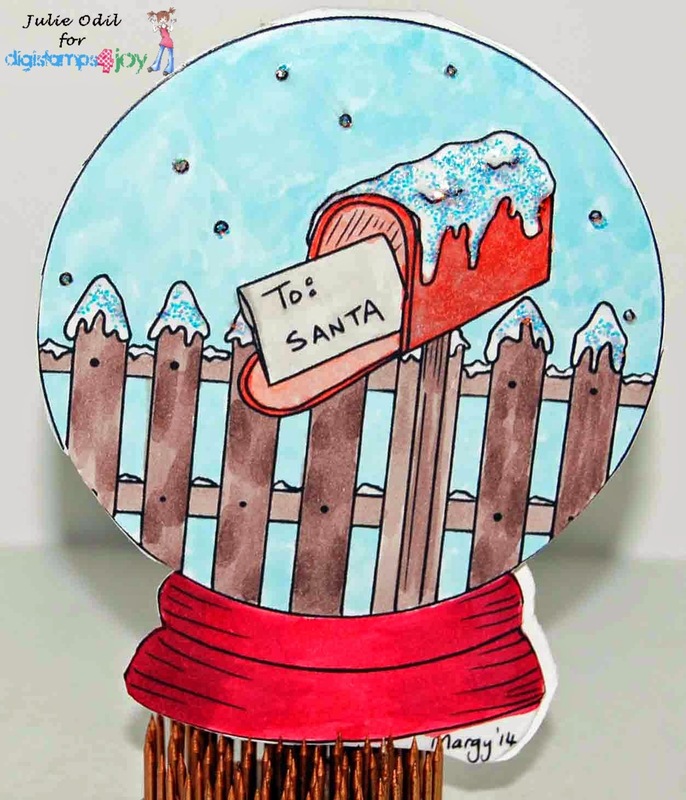 I colored the image with Copic markers, then added some Stickles to the mailbox and tops of fence posts to make it look like sparkling snow. I folded the paper over at the top of the snowglobe, then cut through both layers, leaving a bit of a fold at the top, creating a shaped card. I have a giveaway going on, celebrating several events: I wrote my 500th blog post this week, I'm close to 400 followers on my blog, and I have 100 "likes" on my Facebook page, Muddy Paws & Inky Fingers. To celebrate all those things, I'm having a giveaway: I have some Timeless Twine, some 3 Girl JAM ribbon, a Unity stamp set, a Close To My Heart stamp set, some Pinque Peacock embellishments, a 6x6 paper pad, and various embellishments that I need a home for. I also have two generous sponsors: DigiStamps4Joy is giving a $10 gift certificate to the store, and The Cutting Cafe is offering any 3 sets. WOW! If you'd like to be eligible to win, please leave a comment on any of my blog posts between now and July 6. I'll draw a winner on my birthday. It's my day, and you get the present! I'd also love it if you "like" my Facebook page and follow my blog, if you don't already. I really liked this month's image, and am quite sure I'll use it for more card this Christmas. Thanks, Margy! I can't wait to see what July's image will be! It seems I'm drawn to frogs and umbrellas lately. Maybe it's the unusually rainy weather we're having, or the thousands of frogs I hear croaking from the lake across the road every evening. They're so loud, some nights it's hard to fall asleep -- but in a good way, if that makes sense?!? 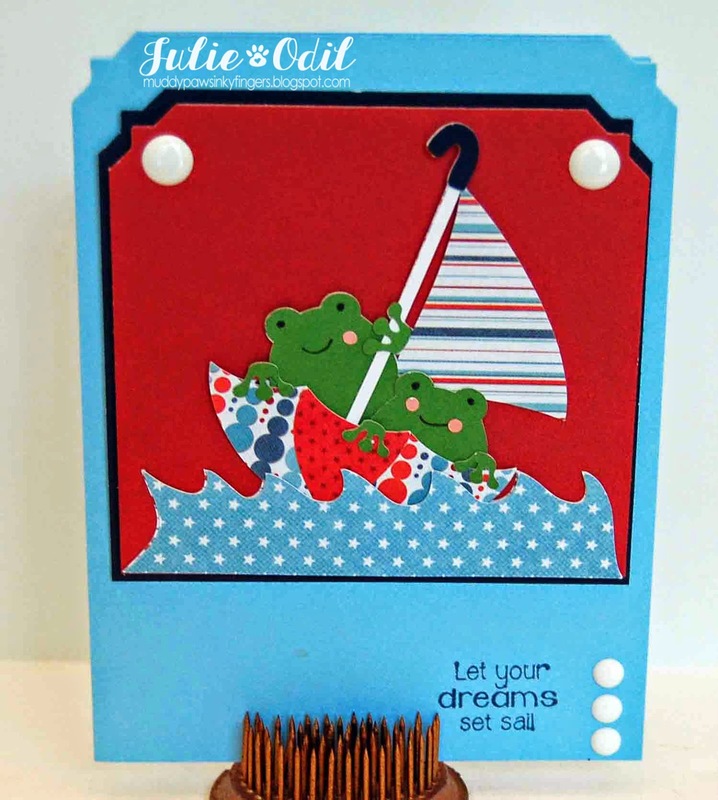 Just two frogs, sailing along in their own patriotic umbrella. Since it's so close to July 4th, I thought they might as well be Patriotic on their sailing adventure! This My Scrap Chick cutting file is called "Rainy Day Kids" and it has some delightful patterns to cut out. I cut this card out on my Silhouette Cameo. I used designer papers from We R Memory Keepers. The sentiment is a stamp from Unity Stamp Company. The enamel dots are from My Mind's Eye. All solid color card stock is from Close To My Heart. I have a giveaway going on, celebrating several events: I wrote my 500th blog post yesterday, I'm close to 400 followers on my blog, and I have 100 "likes" on my Facebook page, Muddy Paws & Inky Fingers. To celebrate all those things, I'm having a giveaway: I have some Timeless Twine, some 3 Girl JAM ribbon, a Unity stamp set, a Close To My Heart stamp set, some Pinque Peacock embellishments, a 6x6 paper pad, and various embellishments that I need a home for. I also have two generous sponsors: DigiStamps4Joy is giving a $10 gift certificate to the store, and The Cutting Cafe is offering any 3 sets. WOW! 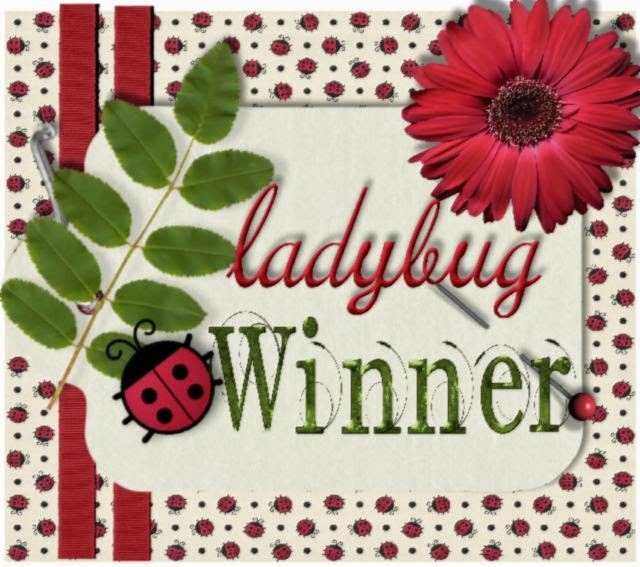 If you'd like to be eligible to win, please leave a comment on any of my blog posts between now and July 6. I'll draw a winner on my birthday. It's my day, and you get the present! I'd also love it if you "like" my Facebook page and follow my blog, if you don't already. 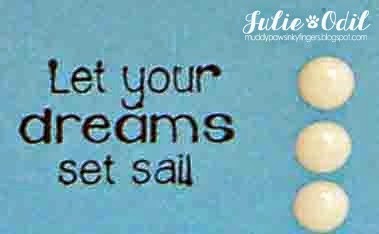 So, off you go -- let your dreams set sail! Say 'Cheese' for Timeless Twine and my 500th Blog Post! Woohoo! 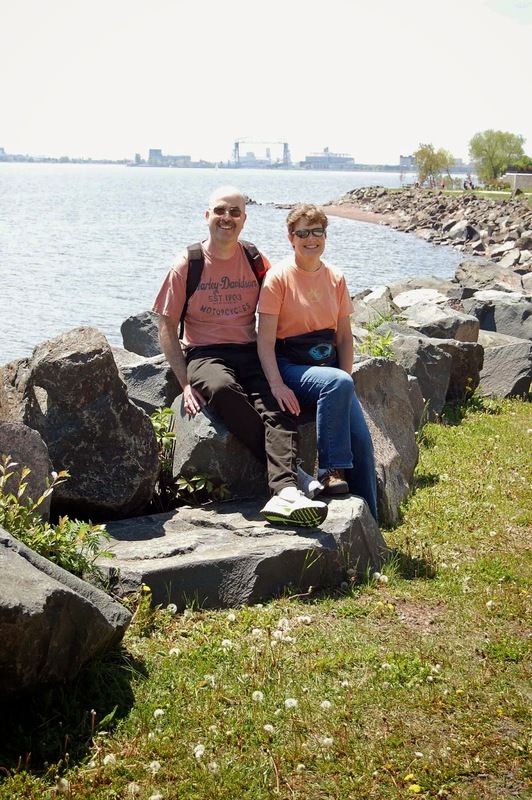 This is my 500th blog post! Cause for a celebration, I think! I'm also very close to 400 blog followers and have nearly 100 'likes' on my Facebook page, Muddy Paws & Inky Fingers. So, with so much happening, it's time for a giveaway! More on that at the end of this post. 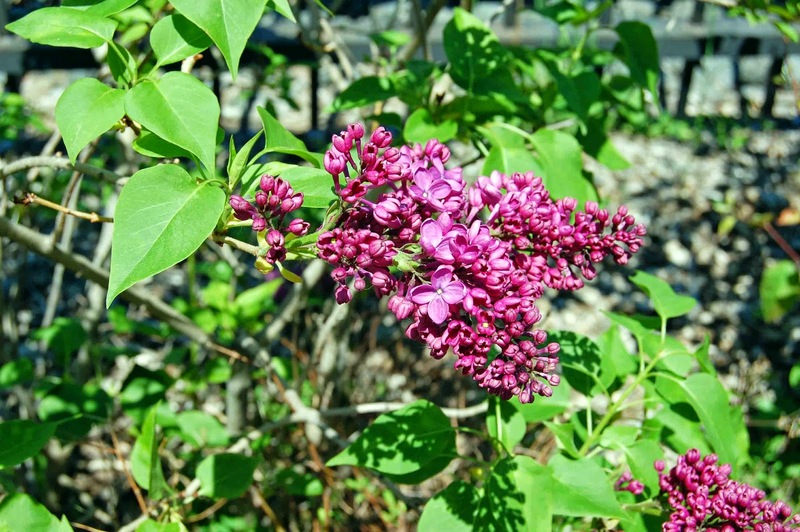 I'm posting today on the Timeless Twine blog, and I always love to make projects with twine. It makes me happy. Today's project is no exception! I found this little girl silhouette in the Silhouette Online Store, and I thought she was so sweet. 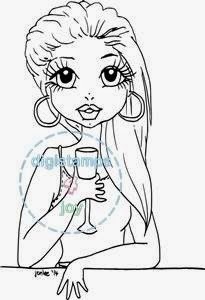 I thought she would compliment the Bella Creationz stamp set, "Oh Snap". 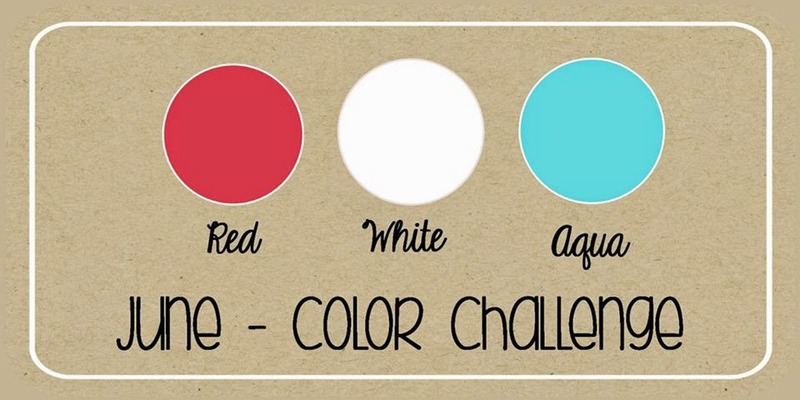 I also used the colors in this month's Timeless Twine Color Challenge: Red, White, and Aqua. Please join the challenge! There's great prizes to be won! All cardstock in this card are from Close To My Heart. Now, did I mention something about a giveaway? I have some Timeless Twine (of course!!! ), some 3 Girl JAM ribbon, a Unity stamp set, a Close To My Heart stamp set, some Pinque Peacock embellishments, a 6x6 paper pad, and various embellishments that I need a home for. I also have two generous sponsors: DigiStamps4Joy is giving a $10 gift certificate to the store, and The Cutting Cafe is offering any 3 sets. WOW! If you'd like to be eligible to win, please leave a comment on any of my blog posts between now and July 6. I'll draw a winner on my birthday. It's my day, and you get the present! I'd also love it if you "like" my Facebook page and follow my blog, if you don't already. It's Monday, which means there's a new challenge starting today at Eureka Stamps. This week's theme is 'Picnic'. How fun is that? 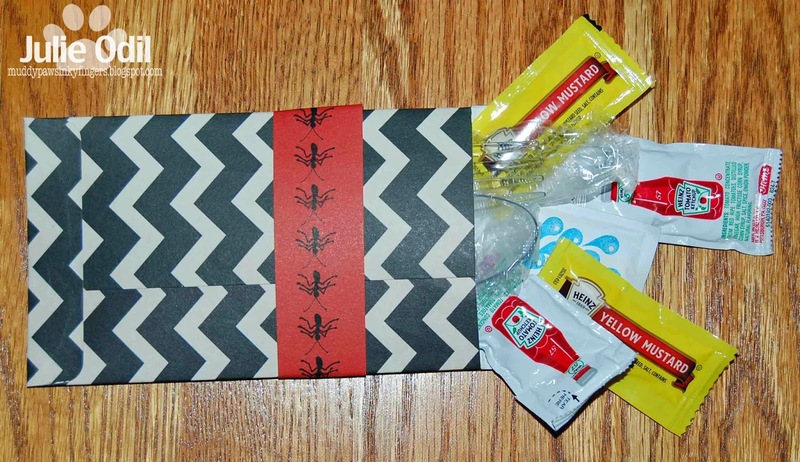 I filled the envelope with things you'd need at a picnic -- plastic fork and spoon, a napkin, ketchup and mustard, even a moisture wipe. No bug spray, though, LOL. 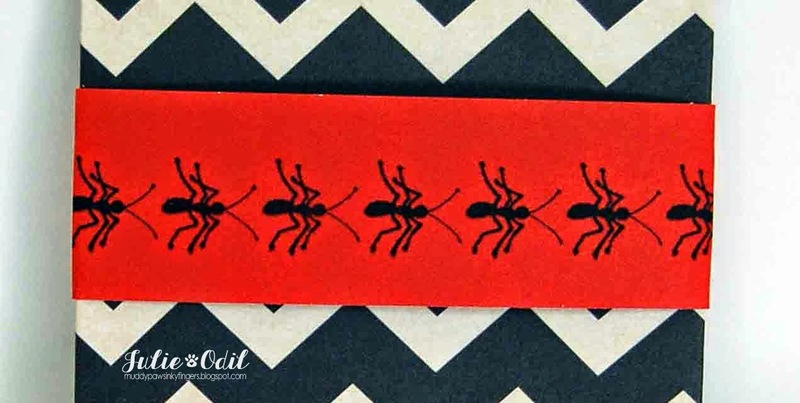 Here's a close up of the belly band and the adorable ant stamp. It's summer, so it's picnic season. Make a picnic project and link up with us at the Eureka Stamp blog. I'd love to see what you make! I have a giveaway going on, celebrating several events: I wrote my 500th blog post today, I'm close to 400 followers on my blog, and I have 100 "likes" on my Facebook page, Muddy Paws & Inky Fingers. To celebrate all those things, I'm having a giveaway: I have some Timeless Twine, some 3 Girl JAM ribbon, a Unity stamp set, a Close To My Heart stamp set, some Pinque Peacock embellishments, a 6x6 paper pad, and various embellishments that I need a home for. I also have two generous sponsors: DigiStamps4Joy is giving a $10 gift certificate to the store, and The Cutting Cafe is offering any 3 sets. WOW! If you'd like to be eligible to win, please leave a comment on any of my blog posts between now and July 6. I'll draw a winner on my birthday. It's my day, and you get the present! I'd also love it if you "like" my Facebook page and follow my blog, if you don't already. Happy Monday, everyone! I'm joining the talented Fitztown design team as a guest designer today. The challenge that starts today is one of my favorites -- shaped cards. I adore shaped cards! 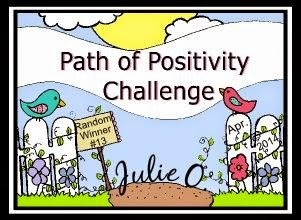 So, this was a fun challenge for me to participate in! I colored the image with Copic markers, then fussy cut it, and mounted it with 3D foam squares. 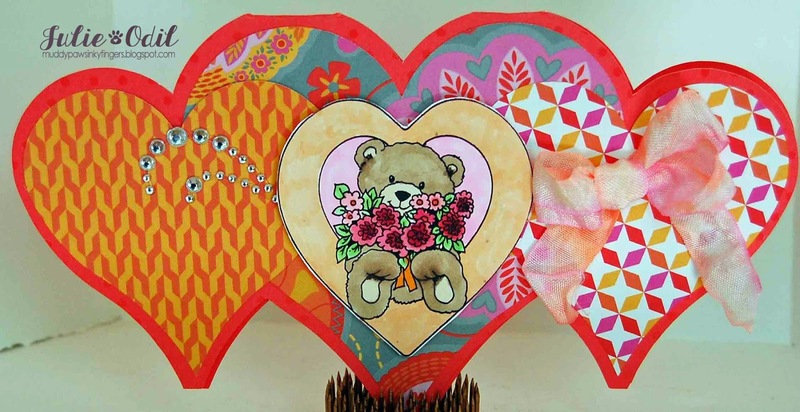 The card design is a cutting file from The Cutting Cafe, called "Heart Shaped Card 2" set. The papers and bling are from Close To My Heart. The crinkle ribbon is the new Tie Dye ribbon from 3 Girl JAM. 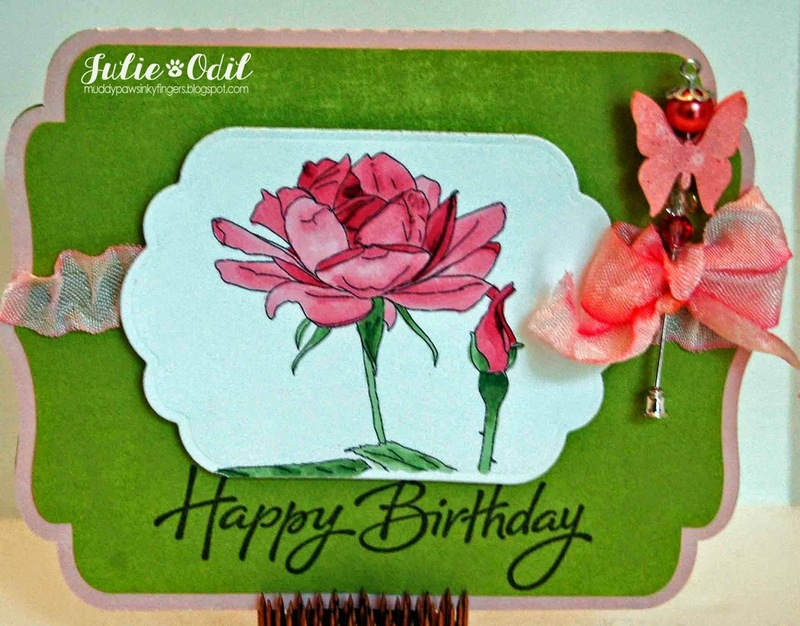 Make sure to check out the Fitztown Challenge blog to see the other inspiration from the design team, and then make your own shaped card to enter the challenge. You'll have 2 weeks. Ready, set, GO! It's Sunday, and that means there are new releases in the DigiStamps4Joy store! Yeehaw! The design team was given a choice of 2 to work with this week, and I chose, "Cheers". 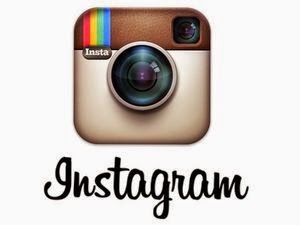 Isn't that image fun? Here's the digi image - "Cheers", released today. I have a new Spellbinders die, Shuttered Window, that I've been itching to try, and this card was perfect for it. The designer papers areby My Mind's Eye. All cardstock is Close To My Heart. The sentiment is from Unity Stamp Company. I colored the image with Copic markers. There's some of my favorite twine -- Timeless Twine, in Raspberry Lemonade. Please visit the DigiStamps4Joy blog today to see what the other members of this talented design team have made with the new releases. You won't be disappointed! Looking for the Patriotic Firefly for My Scrap Chick? Please click HERE! Hello, and happy, happy Friday! With only a 20% chance of rain today, it's a very happy Friday! Our neighborhood is flooded from so much rain. We usually have 3 inches for the month of June. So far this month, we've had over 20 inches. I live across the road from a lake and it has spilled it's banks. Some basements are flooded, other homes are flooded. Directly across from us are some condos. For over a week now, 2 of the units have had water running in from the lake, through the house, out the garage, down the driveway, and into a culvert. It's so sad! Then, several nights ago we had some very strong winds. Trees that having been sitting in water for several weeks now, with very wet root systems, toppled over easily. One landed on the roof of the same flooded condo. The next night, another fell on the garage and car. Talk about bad luck! We, fortunately, are dry so far. Every spare minute we have, we're re-arranging the basement, buying totes, and elevating what we can, just in case. And, that's where my craft room is. Waaah! But so far, so good! 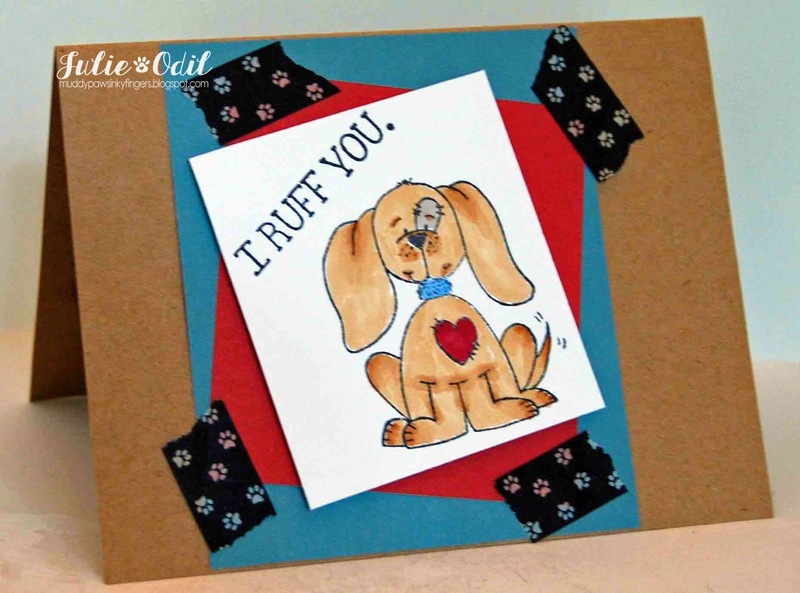 It uses the Unity Stamp Company stamp set, "Puppy Ruff." I colored the image with Copic markers, making it the color of my two Golden Retrievers. I used some paw print washi tape, and layered up some matching card stock -- a very simple card. 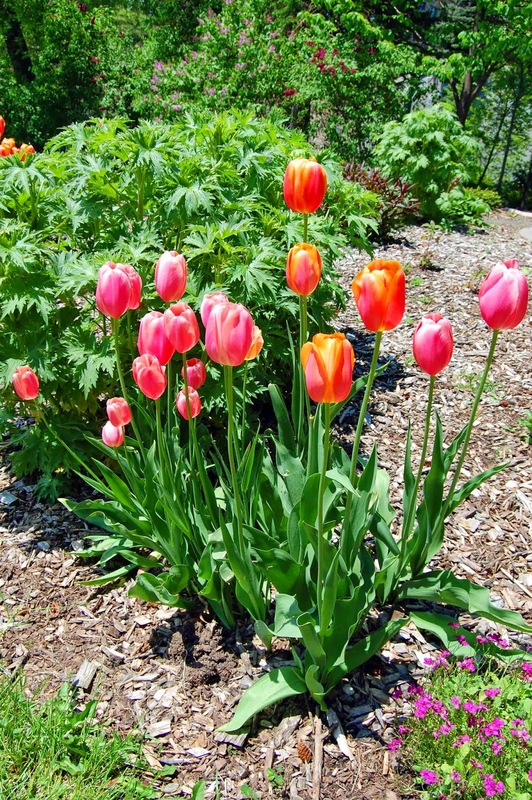 The tulips were so pretty! I had no idea this would be such a long post. If you made it to the end, THANK YOU! Have a great weekend. Leave a comment and I will visit your blog!